Within a marketing landscape that’s increasingly oriented towards having multiple channels and customized communications, automatic workflows offer companies an exceptional opportunity for growth. There are many motivations that drive companies to adopt Marketing Automation systems: automatic emails are instant, personalized, and extremely relevant to your recipient. This boosted effectiveness of your campaign has direct results in terms of openings and click rates, which are higher and more frequent than in non-automatic communications. In turn, this positive trend translates into increased conversions and revenues for your company. Marketing Automation is the synthesis of a variety of complex activities with different tactical and operational goals that can be traced back to a final, triple goal: to personalize user experience as much as possible, create a personal conversation with each user, and ultimately maximize the ROI of each individual marketing channel. It therefore comprises email and SMS campaigns that are automatically activated based on the actions and behaviors of users. Unlike a one-shot promotional campaign, an automatic message is created and set up only once, and then sent to database contacts whenever certain conditions are met. For example, if we were to create and manually send an email to all new newsletter subscribers, it would employ a considerable amount of time and resources. On the contrary, automatic deliveries speed ​​up and simplify such marketing activities. This is the real advantage of an automated system: once you set up your rules and content, the system does all the work for you. Confusion often arises when discussing automations, workflows, drip campaigns, and automated deliveries. Let’s try to clear all that up and dispel any doubts. Marketing Automation is a set of flows, technologies, and tools that allow for the automation – based on predefined triggers – and optimization of marketing efforts. Triggered messages are like a “broken” workflow, and lack connecting events and triggers. They are individual messages that are sent automatically when certain conditions are met. 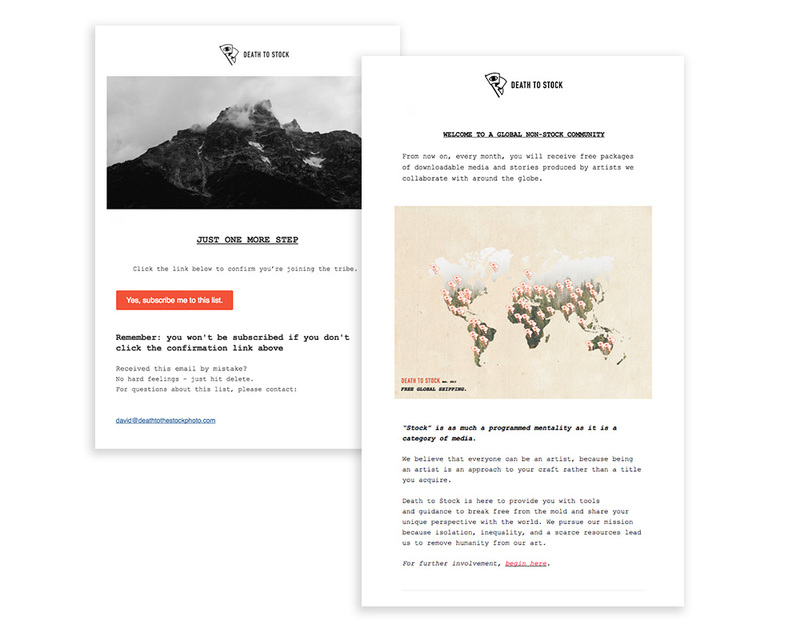 A campaign that is activated after a newsletter or website subscription. You must initially create at least a double opt-in email and an authentic subscription confirmation email. A campaign to encourage users to buy the products in their shopping cart if they abandoned it before completing the purchase. This is one of the most effective types of workflows, with some of the greatest economic returns. 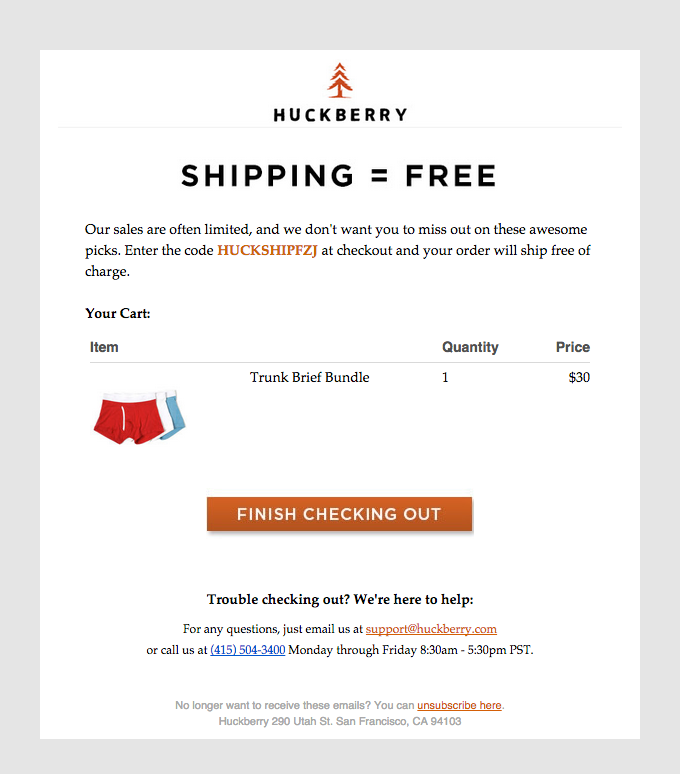 A campaign sent to customers after their first purchase to “survey” their satisfaction and propose upselling and cross-selling products related to their first purchase. 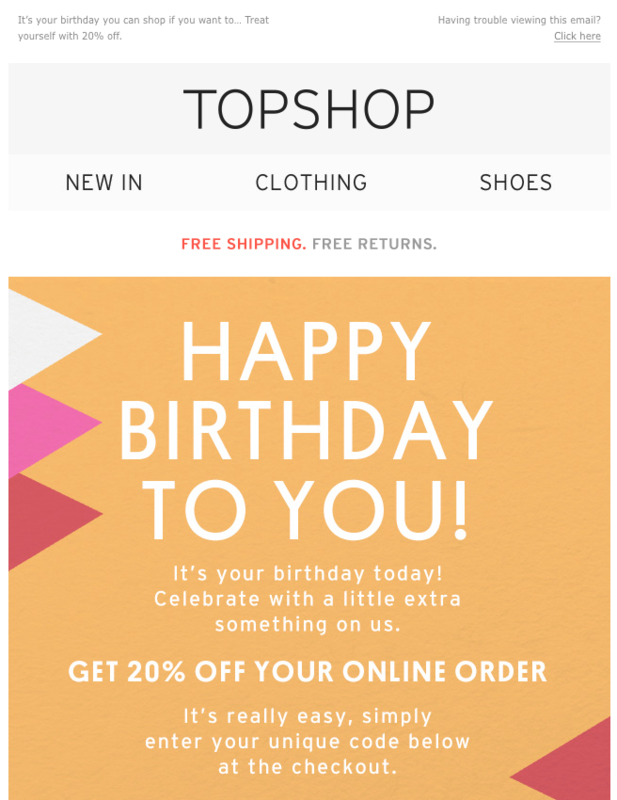 An automated message sent on the user’s birthday with best wishes and a complimentary discount for stimulating engagement and encouraging an additional purchase. A campaign sent to customers for the sale of products/product categories the user has expressed preferences in through previous purchases, website navigation, or interaction in social networks, emails, live chats, etc. In this type of campaign, purchase data is crossed with behavioral data. A campaign sent to your best customers (most frequent and/or with high spending capabilities) to increase their loyalty and advocacy. A campaign for customers who haven’t made a purchase for a certain period of time, with the aim of ‘reactivating’ them and encouraging them to make another purchase. A campaign sent based on your user’s location. This is especially useful for retail businesses that combine online sales with sales in their retail outlets. The prerequisite for creating automatic campaigns is correct contact database profiling: without having users’ master data and information regarding their behavior, it’s impossible to determine the trigger variables that activate automatic flows. Check the main statistics in real time and create an aggregate report for viewing the detailed statistics. A pre-configured workflow based on a template that has already been set according to best practices, which can be customized as necessary. 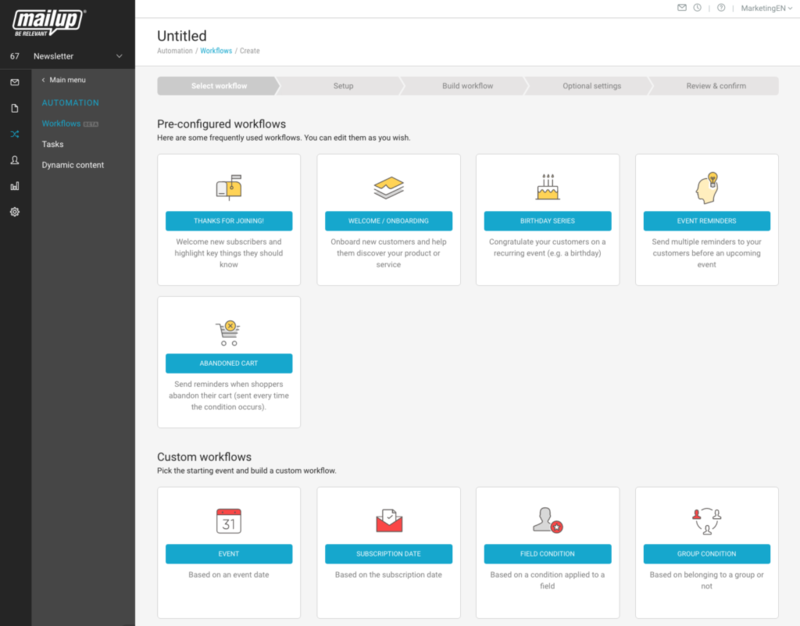 A custom workflow that is built by choosing one of several available initial conditions, a master data filter, or an existing activity filter. 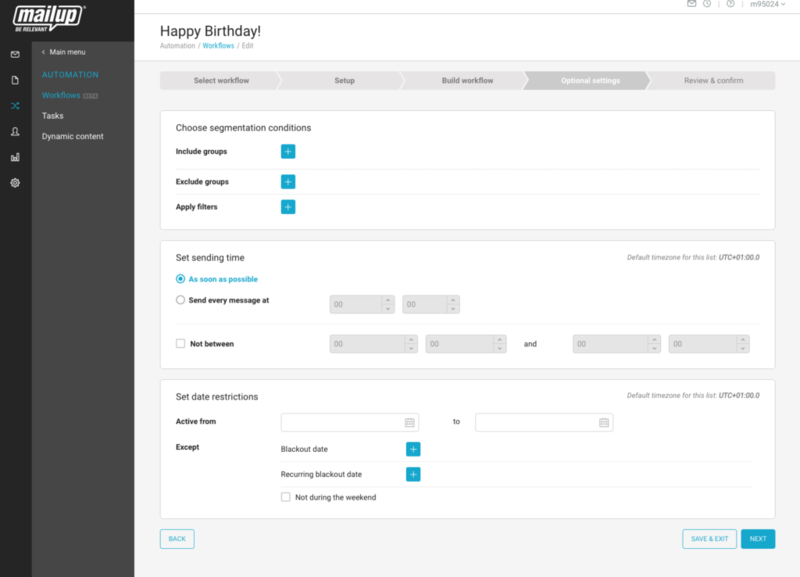 In this case, we’re going to choose a pre-configured happy birthday template and proceed. 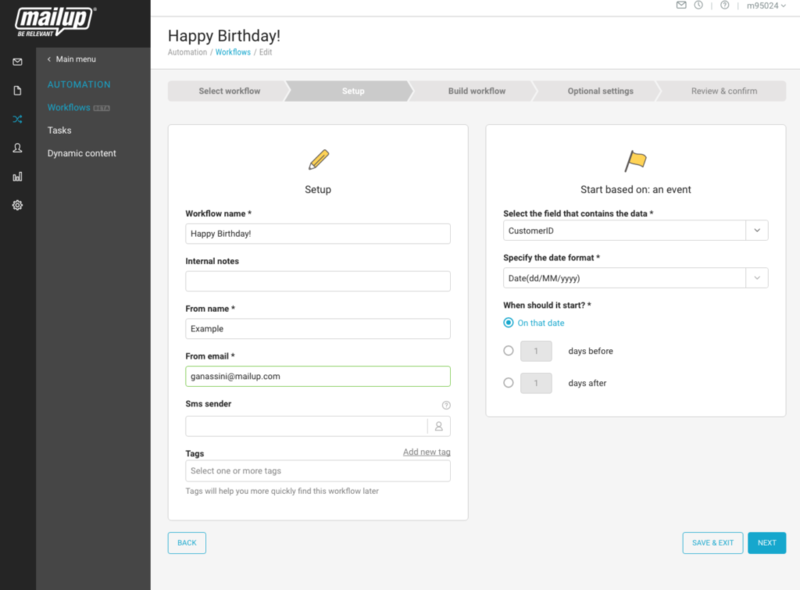 The second step is to set configuration or setup data (the same for all workflows) and the initial condition that triggers the workflow (different depending on the type of workflow: in this case, the recipient’s birth date). The convenient drag & drop interface is ideal for building an automatic flow in only a few minutes. 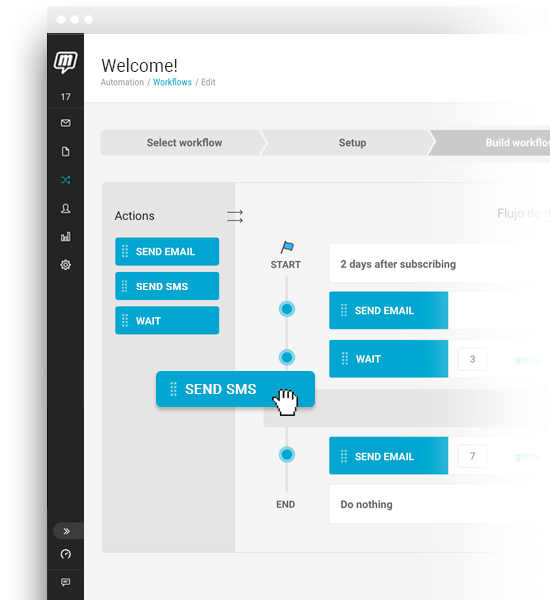 Structure the email and SMS sequence by dragging the tabs on the left to inside the flow. Choose the messages you want to pair with each automatic delivery. Select the waiting time between the messages and the criterion that determines its calculation (i.e. by days/hours from the message’s delivery/opening/click/failed opening/etc.). Decide whether to copy or move recipients to a specific group once the workflow is complete. Insert restrictions by date and time. The ability to view statistics regarding individual recipients by filtering emails or SMSs. This information offers the immense advantage of allowing you to accurately evaluate the performance of each step of the workflow in a timely manner to check if the messages are triggered correctly. If something got stuck, where did it stop? Is there a weak subject that is affecting openings? Or perhaps incorrect conditions have been set? Marketing Automation offers an exceptional opportunity to any size company. It allows you to improve customer experience, send more pertinent and timely communications relating to each user’s behaviors and interests, thus maximizing your return on investment in each individual channel.